This book includes a CD ROM that the owner can use to perform their own project risk management process capabilty maturity model assessments. pdf lealet including price reduction code from the publisher. 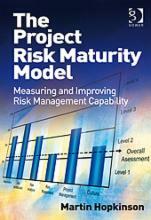 The Project Risk Maturity Model included in this book has been used to perform more than 300 risk management process capability assessments on projects with a combined value in excess of £60 billion. After these assessments were introduced by the UK Ministry of Defence in 2004 as a precondition of Main Gate approval for major equipment procurement projects, the time and cost performance of approved projects was proved to be greatly improved in comparison with their predecessors. The book includes a case study that quantifies the degree of improvement that was measured. It also describes how applying the tool to all projects improved the organisation's governance of project management.